You may need to clear your console's system cache. There may be a problem with your profile. There may be a problem with the hard drive to which you're trying to download content. Note It doesn't matter which storage device that you choose. This clears the cache for all storage devices. Note When you've successfully cleared the system cache, you'll return to the Storage Devices screen. 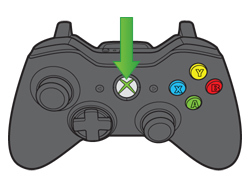 You can then press the Guide button on the controller and return to Xbox Home. If you don't connect any external storage devices to your Xbox 360 console, select Hard Drive. If you do use external storage, instead select All Devices. Select Delete Profile Only. This option deletes the profile but leaves saved games and achievements. Note If you select the Delete Profile and Items option, you will delete the profile and the associated saved games and achievements. Enter the email address of the Microsoft account that's associated with your Xbox Live profile. If you don't know it, use the Lost Account Solution. 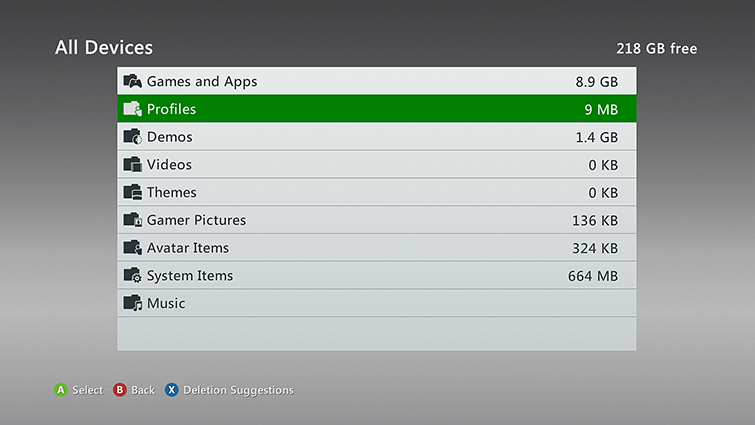 If you use external storage on your Xbox 360 console, select the storage device on which you want to save the profile. If you don't use external storage, your profile will begin downloading. 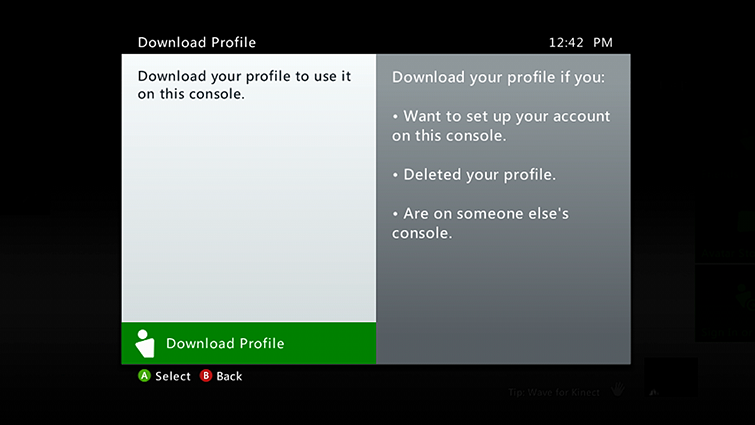 After you re-download your profile, you'll be asked if you want the Xbox 360 console to remember your password. Keep in mind that when you choose this option, anyone else who uses your console can sign in as you and use your account information. This includes any credit card information you might have saved. Leave the Remember Password option unselected if you want the console to require a password to sign in to your account. This is a good idea if others in your home can easily access your console, or if you downloaded your profile at a friend's house. 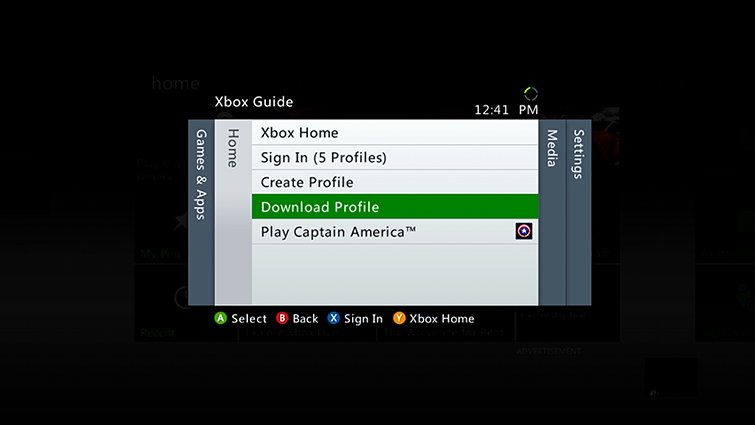 On your Xbox 360 console, sign in to Xbox Live with the gamertag that you used when you originally purchased the content. On your Xbox 360 console, go to settings, and then select System. Select the content type that you're trying to download. Find the item that you're trying to download (it may appear with a yellow warning icon). On your Xbox 360 console, sign-in to Xbox Live. Browse your download history, select the item and then follow the on-screen instructions to download the item again. If you're trying to download the item to a hard drive, try to download it to a different storage device instead. If this solution works, there might be a problem with your hard drive. See Troubleshoot Xbox 360 Hard Drives. 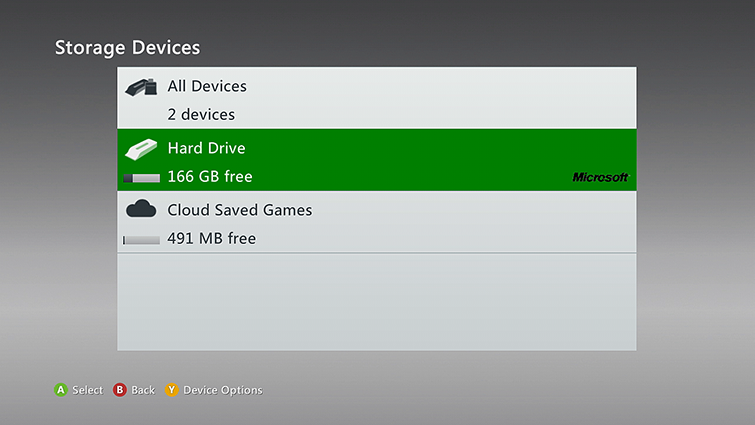 For more information, see Xbox 360 USB flash drive FAQ and Xbox 360 storage. Would you like to contact Support regarding the "Error 80070570 occurs when downloading content from Xbox Live on Xbox 360" issue you were reading about or a different issue?